Here's a great giveaway for you! Purex has changed the rules. No more sorting whites and colors. Purex has developed a new "Anti-Color Transfer Technology" that makes sorting clothes a thing of the past. The new technology traps loose dyes in the wash and reduces color bleeding in your mixed loads. My kids do some of the laundry in my house. Sorting is not their thing. No, not even on their radar when I asked them to start a load of laundry. Jeans, black tees, white socks, khaki shorts, red skirts - it all goes in there together with not a care in the world. Until their white socks and underwear are pink. Then they care. A lot. I can't even count how many items have been damaged by color bleeding. I am a sorter. I've never intentionally tossed lights and darks into the washer together. It just feels wrong. I wasn't sure about this Purex No Sort for Colors detergent. This weekend, though, the kids and I were involved in a community service project at a local thrift store where we did a lot of yard work ("a lot" is an understatement ... we had no idea what we'd volunteered for but it took 20 people almost 6 hours to get the work done and everyone worked really hard). We came home covered in dirt and mulch. I did not want our filthy clothes washed with everything else we owned so I thought I'd give the No Sort a try, mixing jeans, socks, and t-shirts of a variety of colors. Not only were there no color bleeding accidents, the clothes came out very clean and smelled great. Very impressive ... and so much easier and more efficient than dividing the laundry into two loads. Simplify a small corner of your life, avoid laundry mishaps, and even put the kids in charge of doing a few loads for free by winning (1) of (2) coupons for a free bottle of Purex No Sort. The two winners will be chosen Monday, April 21st. Enter in the Rafflecopter-thingy below. Good luck! 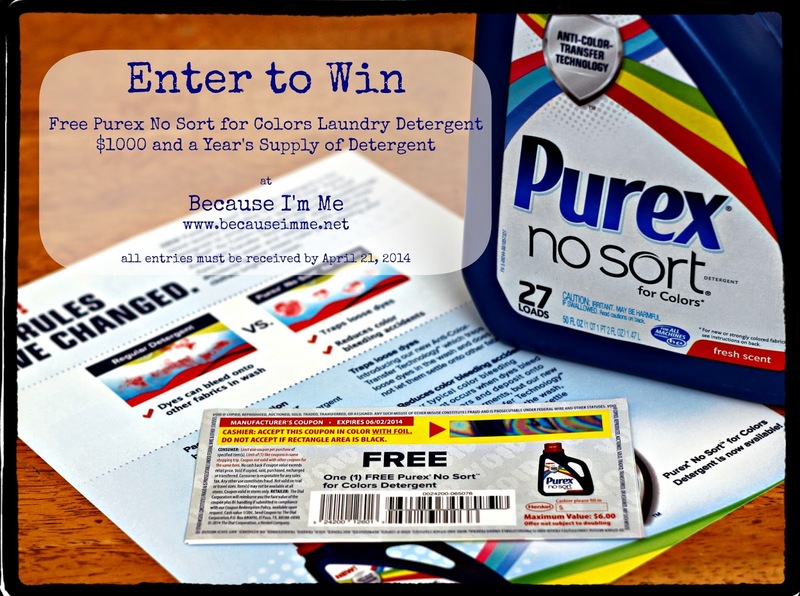 Also, click here to enter to win $1000 and a years supply of Purex No Sort.